During December 2008, the Deir Abu ‘Ali site (map ref. 20130/62474) was documented in the wake of prolonged plundering and damage to the remains of a building and burial cave. The documentation, on behalf of the Israel Antiquities Authority, was performed by S. Ganor and A Ganor. The site, located on a hilltop c. 1 km east of Ramat Bet Shemesh, is mentioned in several studies. 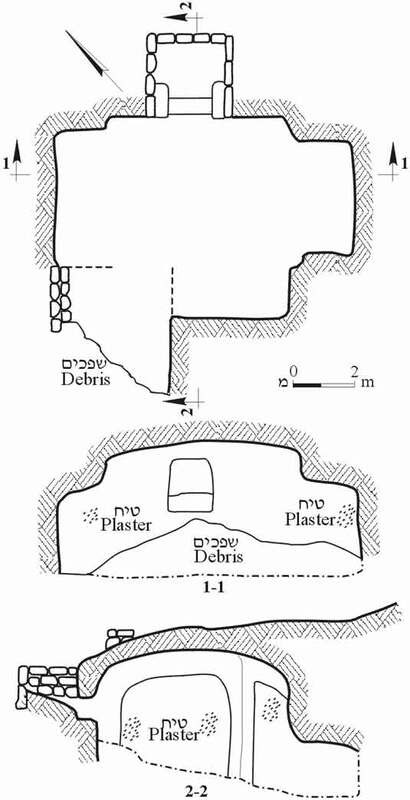 Conder and Kitchener (1881–1883, SWP III: 91) described remains of modern walls at the site; Father Stephan (JPOS 19:142) noted remains of a monastery in the vicinity of Beit Jimal and referred to Khirbat Deir Abu ‘Ali; Tsafrir, Di Segni and Green (1994. Tabula Imperii Romani Iudaea-Palestina: Eretz Israel in the Hellenistic, Roman and Byzantine Periods-Maps and Gazetteer. 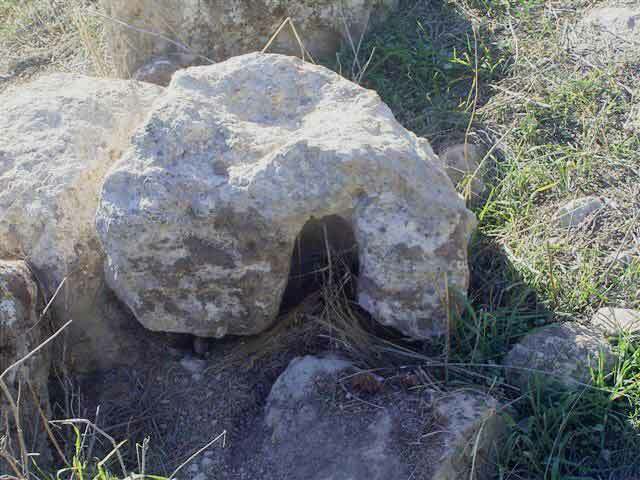 Jerusalem, p. 109) claimed that remains of a monastery and a winepress existed at the site, whereas Bagatti (2002. Ancient Christian Villages of Judaea and the Negev [Collectio Minor 42]. Jerusalem, pp. 137–138) postulated that the site included remains of a monastery and a Christian settlement. The site had last been surveyed within the Israel Archaeological Survey (Map of Nes Harim , Site 119) and potsherds dating to the Byzantine period were collected. None of the scholars or surveyors drafted a plan of the site or of the remains present in the area. An enclosure wall surrounds a square compound (100 × 100 m) at the site, which consists of a main building and a nearby entrance shaft that leads to a burial cave. Rock-hewn installations near the building include a winepress and an olive press whose crushing basin is preserved in situ. Massive retaining walls are built on the southern and eastern slopes of the site, caves and cisterns are hewn mostly along the northern slopes; architectural elements, including ashlars, stone lintels, panels, doorjambs and parts of stone sections of a water channel, are scattered throughout the site; and large sections of bedrock are exposed. An izbe was at the site in the Ottoman period and the caves were used as animal pens for sheep and goats. Some of the building stones have been incorporated in secondary use in the izbe. The documentation performed in the wake of the looting encompassed the remains of the main building, two stone lintels decorated with a cross and an arcosolia burial cave that was located beneath the building. An edifice in the middle of the site (12.0 × 25.5 m; Fig. 1) is built of large ashlars (max. length 1 m, height 0.5–0.7 m). Several of the walls are preserved two courses high (up to 1.5 m). The building is divided into three spaces—a courtyard and two halls. The Southeastern Hall (7 × 12 m; wall thickness 0.5–0.6 m) is divided by a wall into a small space and a large one that is twice the size of the other. The doorjambs in the doorway between the two parts of the hall are preserved in situ. A burial cave was discovered beneath the northern corner of the hall (below). A doorway (width 2.5 m) in the northwestern corner of the hall, whose threshold is preserved in situ, links it with the central courtyard. The Central Courtyard (11 × 12 m) is flanked by walls on all sides. The northern corner is particularly massive and built of stones, one meter long. No building remains in the courtyard can be described without excavation. The architectural elements scattered in the courtyard include parts of stone-pipe sections (Fig. 2) and a fragment of a lintel (0.47 × 1.06 m, thickness 0.68 m; Fig. 3), decorated with a cross engraved within a circle (diam. 0.46 m). The distance between the circle and the undamaged end of the lintel is 0.5 m; accordingly, the original length of the lintel can be reconstructed at 1.46 m. The lintel has remained exposed to the elements in the southern part of the courtyard for a long time and its decoration is poorly preserved. Ten meters southwest of the courtyard is another stone lintel (0.68 × 1.75 m, thickness 0.42 m; Fig. 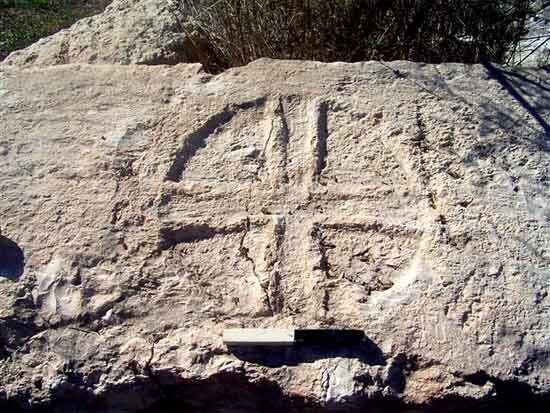 4) of hard limestone, decorated with a cross inside a circle (diam. 0.46 m, 0.65 m from the edge of the lintel). A hewn groove along its bottom was used for the installation of the lintel. The Northwestern Hall (7.5 × 12.0 m). There is evidence of an internal partition inside the hall but it is unclear how this was done. The wall separating the hall from the courtyard is not visible in the eastern corner and it can be assumed that a doorway (presumed width 2.5 m), which connected between the courtyard and the hall, was set there. Next to the southwestern wall of the hall is a doorjamb in situ. An illicit dig that exposed a wall (length 3.4 m, height 1.9 m), in which a doorjamb is fixed, was conducted in the northern corner of the hall. A foundation course of fieldstones in the bottom part of the wall protrudes c. 10 cm from its width. The illicit dig revealed the extent of the walls’ preservation in the hall. A stone lintel (0.7 × 1.6 m) with a groove was found near the wall and the doorjamb. The sections of the walls, the doorjambs and the lintel in the hall indicate that it was divided into at least two spaces. A wall (length 5.7 m) built in the same direction as the building abuts its western corner; however, it is not a continuation of any of the building’s walls and ashlars in secondary use are incorporated in its construction. It is obvious that the wall postdated the building. Outside the hall and 1.5 m from its northeastern corner, an entrance leading to an underground cavity, possibly a water reservoir, was identified; an entrance shaft to a burial cave (below) is c. 0.5 m from the northeastern wall. A square entrance shaft (length 1.15 m, width 1.1 m, height 0.9 m; Fig. 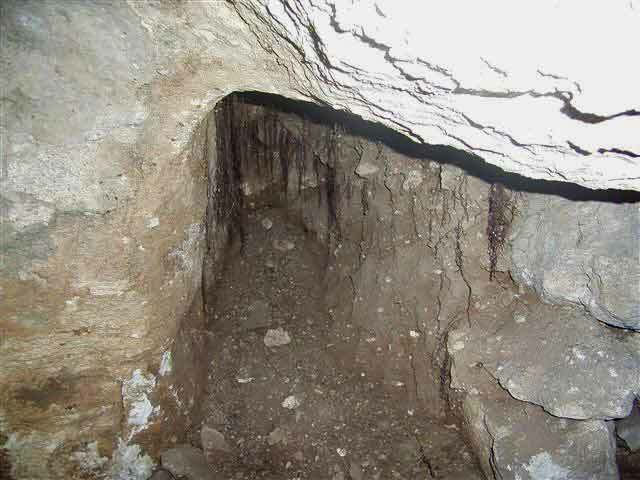 5: Section 2-2) descends from the surface to the entrance of a burial cave. Three sides of the shaft are built of three courses of ashlars (stone dimensions 1.10 × 1.15 m) and the southwestern side is rock-hewn. A trapezoidal opening (width 0.6–0.7 m, height 0.5 m; Fig. 5: Section 1-1) is hewn at the bottom of the southwestern side and a hewn step (width 0.3m) at the bottom of the shaft leads to the cave’s entrance. The sealing stone, found lying on its side at the bottom of the shaft, was probably removed by the antiquities robbers. It is obvious that the plan of the cave was damaged by quarrying in antiquity and later by the antiquities robbers. The entrance leads to a square burial chamber (3 × 3 m; Fig. 6) whose floor is c. 2 m lower that the entrance threshold. Arcosolia (c. 0.8 × 1.8 m) are hewn along three of its sides, which together with the middle of the cave, form a cross-like plan (3.2 × 4.7 m; see Fig. 5). The arcosolia had no burial benches. The walls of the cave are coated with three layers of gray plaster, applied to a base foundation of small potsherds. Faint traces of red and black paint are visible on the plastered walls and an accumulation of silt is found on the floor of the cave. The southwestern corner of the burial chamber was damaged by quarrying and the arcosolia adjacent to it are therefore missing one of their sides. A corridor (Fig. 7), whose one wall is bedrock-hewn and the other (length c. 1 m) is built of fieldstones, extends from this corner. The built wall was probably meant to seal a breach or support the bedrock ceiling of the cave. 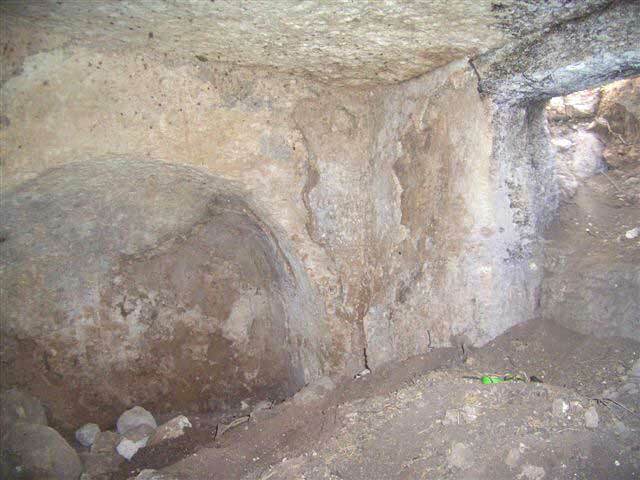 The corridor is blocked with much debris, which makes it impossible to pass through; there is no way of knowing where the corridor leads to without an excavation. However, based on the plan of the cave, it can be assumed that the corridor was hewn in the cave from the outset, and it led to another chamber south of the exposed burial chamber. This supposition is based on the relatively large space (c. 0.9 m) between the ends of the arcosolia and the corners of the chamber and on the straight rock-cutting of the southern wall of the passage, which is uncharacteristic of later breaches. Antiquities robbers were recently active in the corridor, attempting to break through; the debris from their digging was left behind in the main chamber of the cave (see Fig. 6). The cave was hewn beneath the main building and the stones of the shaft that led to it resemble those utilized in the construction of the building. No datable artifacts were discovered in the cave and several fragments of poorly preserved human bones were found. The cave is dated to the Byzantine period on account of its shape and it was probably a crypt that belonged to the building above it. The lintels decorated with crosses, the shaped threshold stones and the doorjambs in the building indicate that this was a large and impressive public edifice. 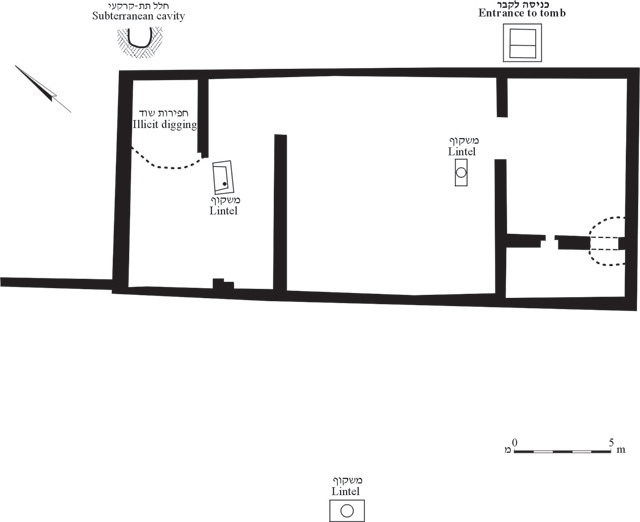 The plan of the building, which includes a central courtyard and two halls adjacent to its two ends, is known in the Byzantine period. Based on the name of the ruin – ‘Deir’ – it is assumed that a monastery was located at the site. The wall enclosing the compound and separating it from its surroundings reinforces this supposition. More than ninety sites dating to the Byzantine period were documented in the region of Deir Abu ‘Ali within the Israel Archaeological Survey (Map of Nes Harim ). 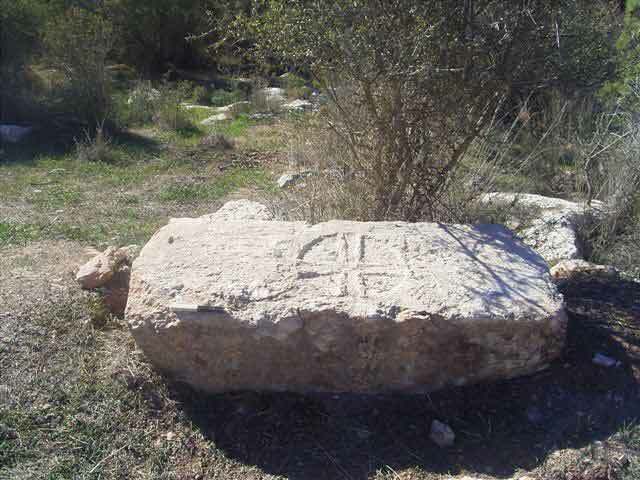 Christian compounds were excavated at Khirbat Hanot, Mata‘ Mizrah, Horbat Bet Bad and Khirbat el-Jurfa. The finds at the site are consistent with those of the survey and excavations in the region, and this is probably another Christian site dating to the Byzantine period. The data points to the settlement expansion in the region during the Byzantine period, as well as to the importance of the Christian settlements proximity to the roads leading up from the coastal plain to the Judean Shephelah and the hill country. The intensity of the remains at the site and its location on a hilltop overlooking the region reflect its strategic role. 1. The main building, plan. 2. The main building, fragment of a stone water pipe section. 3. The main building, decorated lintel. 4. Decorated lintel discovered outside the main building. 5. The burial cave, plan and sections. 6. The burial cave, the main chamber, entrance and arcosolium, looking north. 7. The burial cave, the corridor, looking southwest.